Registration for the San Diego Community College District’s tuition-free, two-year college-degree program is now open for students interested in enrolling at City, Mesa or Miramar colleges in the fall. The San Diego Promise program provides up to two years of tuition-free study for first-time, full-time students. It’s funded through the support of generous donors and the statewide California College Promise program. 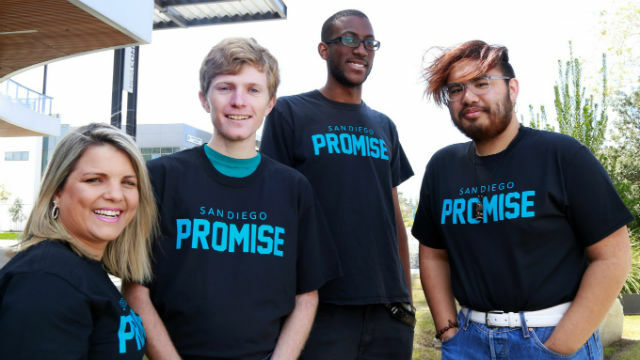 The San Diego Promise launched as a pilot program funded privately in 2016 with an initial cohort of 186 students whose freshman year was tuition free. Fundraising allowed the the district to raise that number to 661 participants in 2017-18. After a new state law provided funding for California Community Colleges to cover a student’s first year of college, the San Diego Promise expanded to 2,100 participants in 2018-19 and included the first two years of tuition and fees for all first-time, full-time students. The San Diego Community College District serves approximately 100,000 students annually through three two-year colleges and San Diego Continuing Education.